This is the home of the famous salted egg yolk cronut. We dropped by Dotty’s Café this morning after seeing that they were serving hot food for the first time this weekend. 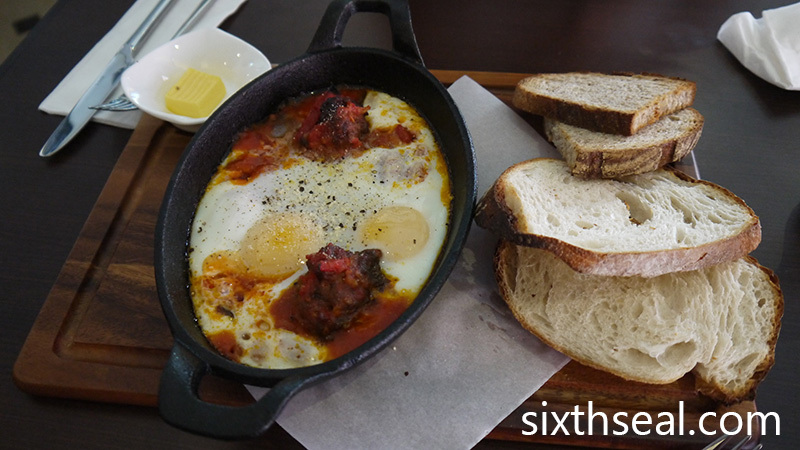 It was our Sunday morning brunch option of the week and we weren’t disappointed. I was actually a little apprehensive that the place would be packed considering its their “opening weekend” (of sorts) but it was quite manageable. 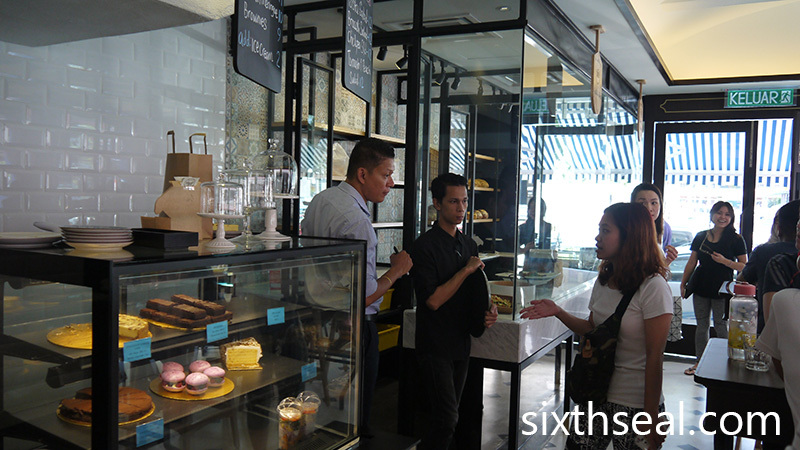 Predictably, most people came here to take away boxes and boxes of their salted egg cronuts. I asked about the availability when we got there at 10:30 am and they were all sold out! I had to wait for the 12:30 pm batch. We ordered breakfast while contemplating whether to wait or not – part of me wanted to just wait for the hype to die down before sampling it but since my better half didn’t mind, we sat there until the next batch came out. This is a really quirky item that Homer Simpson would absolutely adore. My dear wanted to try it and I was curious too after seeing it on their Facebook. It’s a hot donut that’s topped with ice cream with a pitcher of latte on the side. 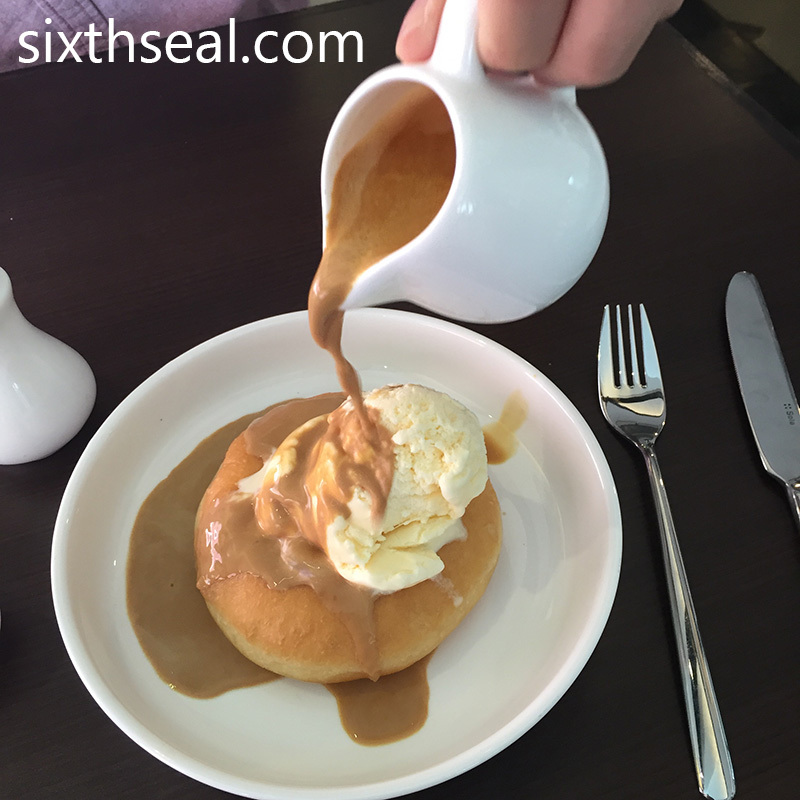 It works a little like an affogato – you basically pour the latte into the doughnut. This has the magical effect of partially melting the ice cream and making the donut soggy. 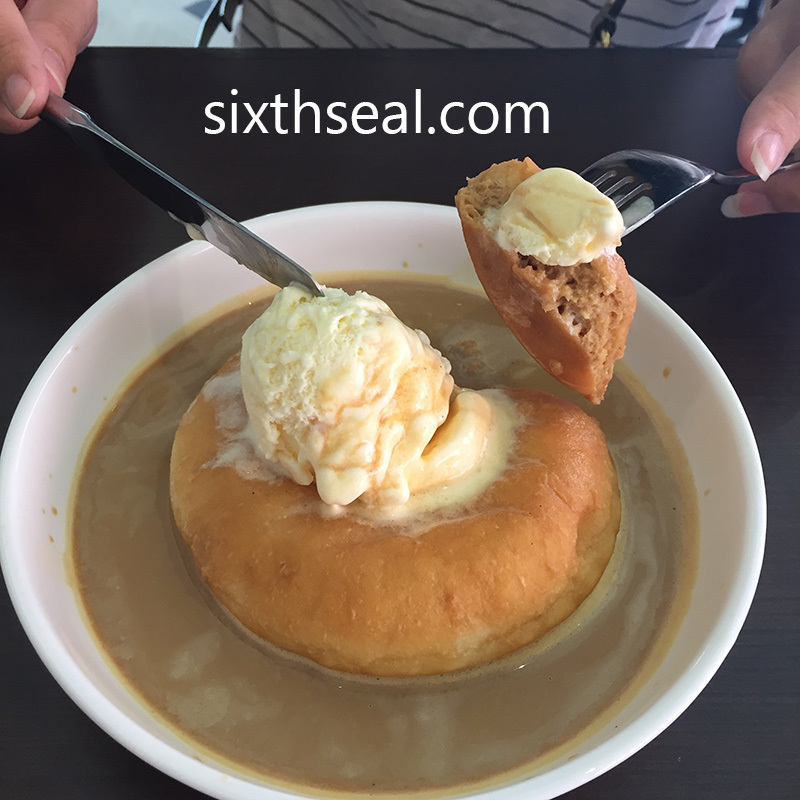 It’s surprisingly good to wolf down bites of the warm coffee-infused doughnut with the colder ice cream as a contrast. It’s pretty good but I would have liked the caramel to be saltier. I’m a huge fan of salted caramel and personally always tend to go more savory but there’s nothing wrong with Dotty’s implementation. 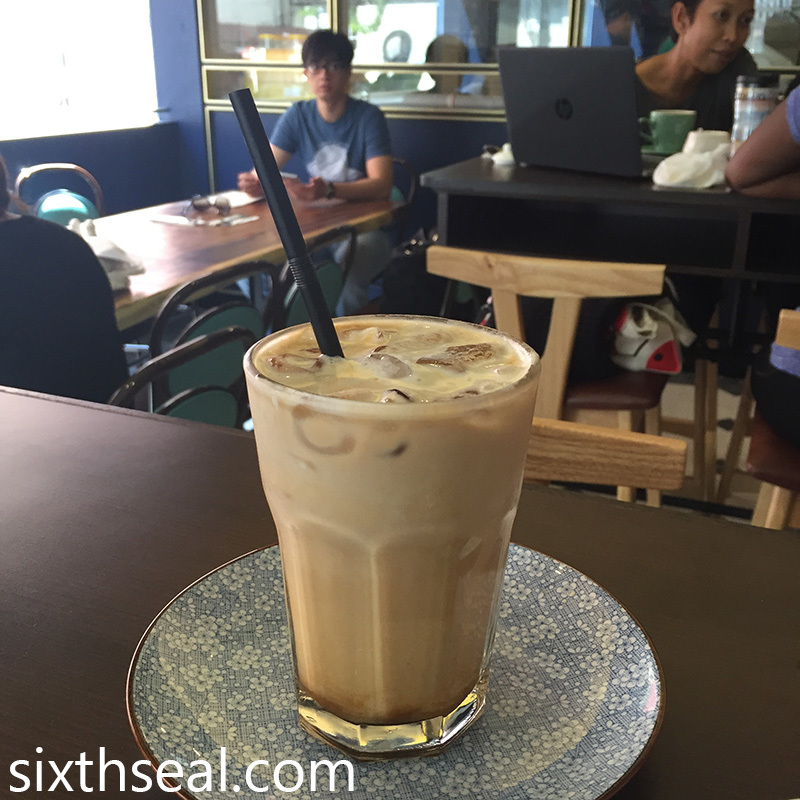 They also have brews like Coconut Milk Latte (RM 14) which would be ideal for vegans, organic food lovers and hipsters alike. We shared this for breakfast. It was one of only three (3) items available on their menu today. I think most of them were sold out, I originally wanted a Salt Beef Sandwich (RM 26) but it wasn’t available. That said, the bread was simply out of this world! It should be noted that Dotty’s Café is also a bakery and all their bread is freshly baked. You can taste the wonderful bread here, there’s sour dough (which goes very well with butter) and slices of brown toast which went perfectly with the baked eggs. I went to New Zealand to study high school when I was 15 years old and have eaten a lot of pavlovas over there. I’ve also eaten a lot in Australia but have always felt that pavlova is more of a Kiwi thing, they do it a lot better. This implementation is also good – there are just three ingredients, the pavlova shells, crème patisserie and berries and it’s a testament to their baking skills that these 3 go so well together. We waited hours for this to come out and finally the floor manager (?) took one out before the 12:30 pm batch and served it to us. I thought it was nice of him to personally do that, and was a bit puzzled when he warned us that it’ll be hot and to wait for it to cool down. It wasn’t hot and I later found out the reason why – it can’t be hot, or the structure of the cronut will be compromised. The salted egg yolk cronut (which is a combination of a croissant and a donut, texture wise, just in case anyone has been living under a rock for the past few years) was really good. I can see why people would wait for this. The thick and generous amount of butter and salted egg appealed to me immensely – it was mouth-wateringly delicious! The beautiful thing about the salted egg yolk cronut is that the insides are filled with the butter-salted egg combination too. It’s very rich and creamy. 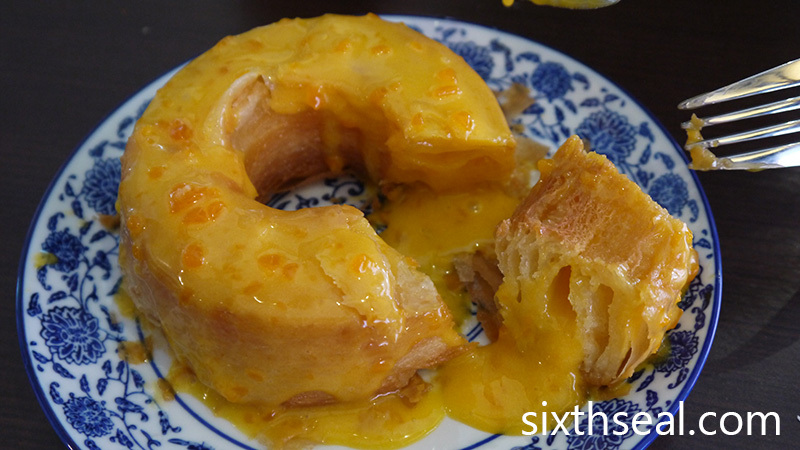 The salted egg yolk cronut is something you have to eat at Dotty’s Café and Bakery. You can take away of course but I personally feel it doesn’t taste the same if left to its own devices for too long. They have a wide range of freshly baked goods (and salads) as well as hot food so we’ll be back again to have brunch another weekend to try their other stuff. The meal cost RM 75 for the both of us, which is cheaper than our usual brunch outings. 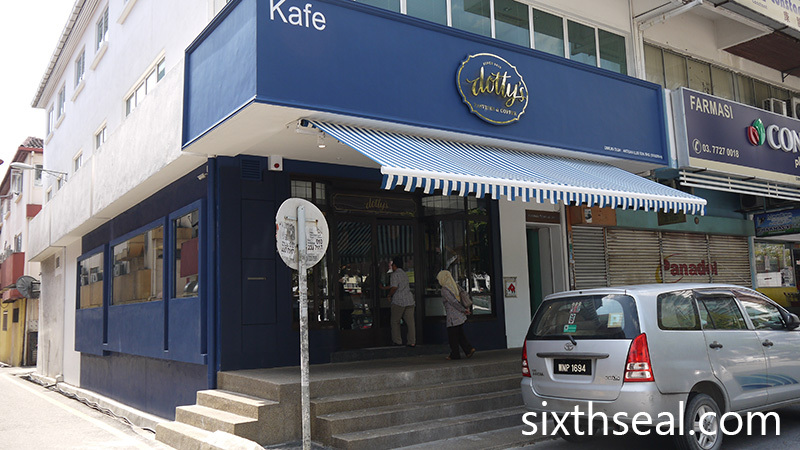 Dotty’s is located at Jalan Tun Mohd Faud 2 in TTDI. 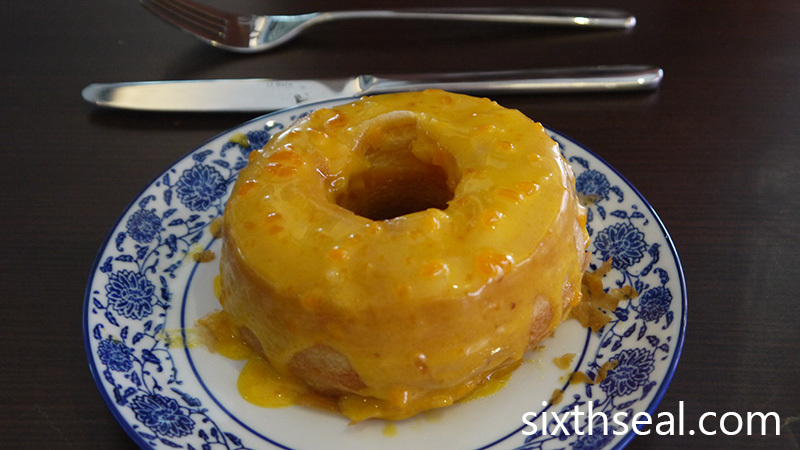 I’ve a weakness for salted egg-yolk & love to try the cronut! Love the food shots! We had the salted egg croissant from SS2 and it’s even better. It was soooo awesome and satisfying. This cronut pales in comparison. It was quite good, this place is nicer but if you like salted egg yolk, the salted egg yolk croissant from SS2 is the best! We just had it over the weekend. I have yet to try a cronut. I know the texture of a croissant and also those of a doughnut but the texture of them when combined – I couldn’t imagine how it would be like. As for the salted egg yolk cronut, I would love to try it too as I love to eat lau sar bao, I imagine the salted egg yolk sauce to be like those fillings of lau sar bao. 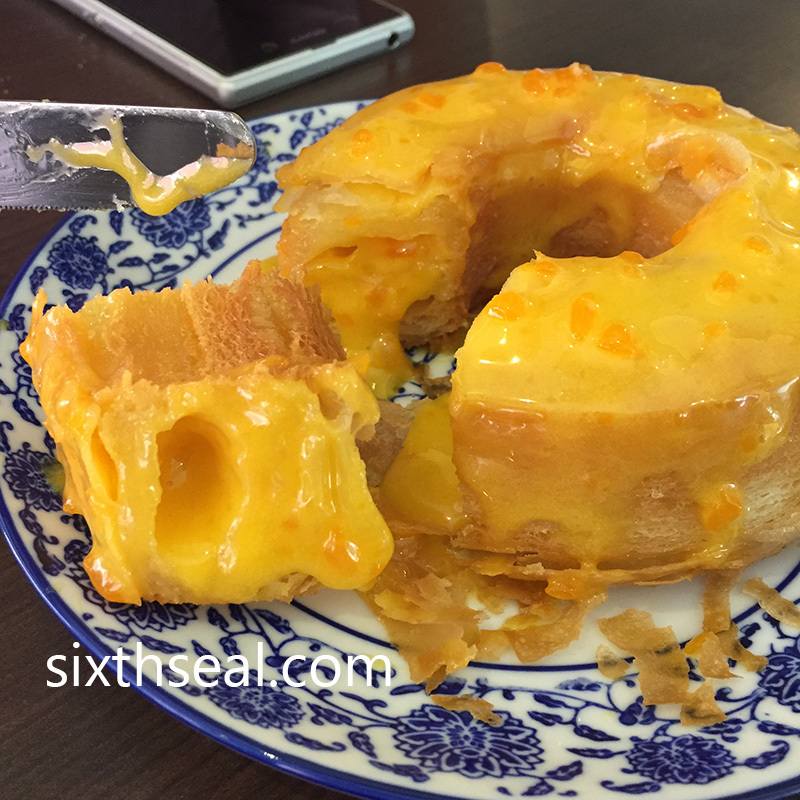 Are there any other places selling this salted egg yolk cronut apart from this cafe? This was a pop up at BIG, the link is above. That was when the New York place just invented it. Oh, you’ll love the salted egg yolk croissant from SS2, it’s soooo awesome! Saw this in a friend’s blog. Looks like this is the current craze, salted egg croissants and this one brings it to another level, cronuts with salted egg. Looks like this one is something best eaten there and then or it may turn soggy? We went on Saturday to try it out since we were in SS2. They were RM 6.50 each, worth every cent! It’s so delicious and warm and satisfying. This one pales in comparison. I think hot is better with these things. I would not mind going back for their pastries. Hmmmm….the cronut, I don’t think I want to wait for an hour plus again, else I really got NUTs! I really enjoyed that. Luckily we did buy 3 of those, at first thought it was too much, later on it was not enough. Haha! I was craving for it too, but since you not feeling well I thought you should have it dear. We can go again! We had another even better one over the weekend – salted egg yolk croissant. 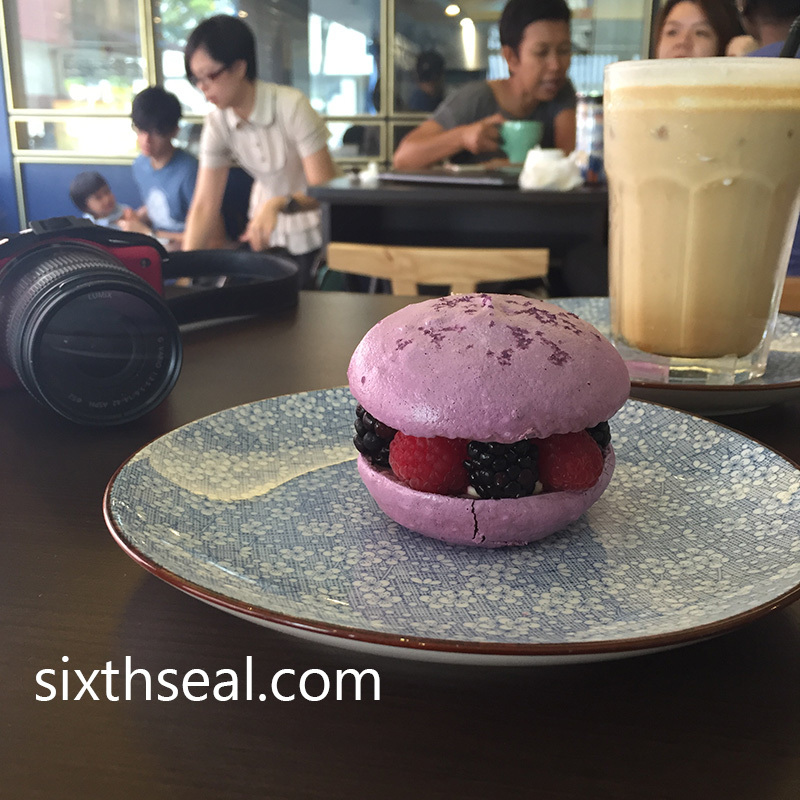 Just finished reading Ling’s review of the cafe… and may I say that the pavlova stands out instead? Although I’ve been to NZ and in Australia now, I haven’t had the chance to eat pavlova – or the ‘unforgettable one’, to say the least. I prefer the salted egg yolk cronut too. 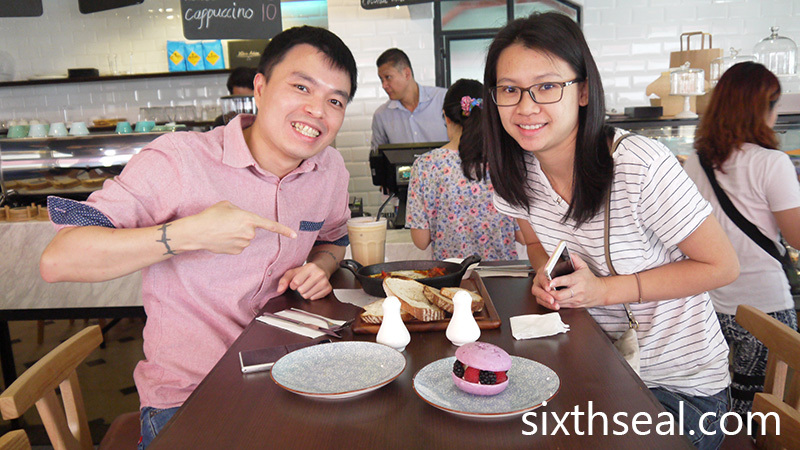 We also had a salted egg yolk croissant from another place over the weekend – that was even better! It was the most awesome thing I’ve eaten this year so far. I don’t mean the one with the long queue, there’s a bakery there selling salted egg yolk croissant for RM 6.50 each. Recently opened, very very good.